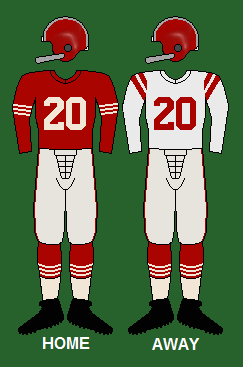 The 1955 San Francisco 49ers season was the team's sixth season in the NFL, and were coming off a 7–4–1 record in 1954, finishing in 3rd place in the Western Conference. San Francisco would replace head coach Buck Shaw, who had been the only head coach of the club. The new coach would be Red Strader, who had previously been the head coach of the New York Yanks from 1950–1951, where he had a record of 8–14–2 in his 2 seasons there. The 49ers started the year with 2 losses at home, but would rebound with 2 road victories and sat with a .500 record after 4 games. San Francisco would split their next 2 games at home and have a 3–3 record. The team would then fall into a slump, and lose their next 5 games, before winning their final game of the season, and finish the season with a 4–8–0 record, their worst season since the team's first season in the NFL in 1950, when they finished 3–9–0. Offensively, Y.A. Tittle threw for 2185 yards, completing 51.2% of his passes, and had a league high 17 TD passes. However, Tittle would have 28 passes that were intercepted. Billy Wilson was Tittle's favorite target, as he would have a team high 53 receptions for 831 yards and 7 TD's. Joe Perry led the club by rushing for 701 yards, while Dickie Moegle rushed for a team high 5 TD's.